Yay! I have struggled with making my short rows look purty. I am excited about trying your technique. Thanks for sharing! I look forward to trying this. It looks awesome. Yes! I'll be coming back to these instructions for my next pair of socks. Thank you. Thanks for the tutorial. Tried it and I like the outcome! That's a great tutorial! 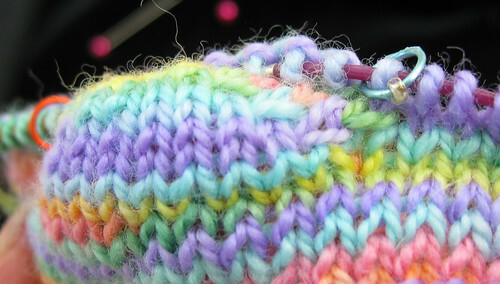 I especially like the way that you have shown which stitches get knit together with those little brackets. will you be doing some more/different fibres soon? OMG! Amazing! I've got to check this out. And thanks--I know from experience that preparing those photos and writing something that makes sense takes a LOT of time! I now will condescend to make short-row heels in socks. This is just GREAT. Oh happy happy dance. I really, really hate the way short rows look and this looks much better. And it's easy. And I can remember it. GO YOU! Brilliant! I am approaching the heel of a sock to try it on. Wow! This looks a lot better than the usual wrap and turns! Thanks for figuring out all these tricks! You should write a book: "Fleegle's Knitting Techniques"! Trying it tomorrow, my one day off! Thank you for sharing this. Fantastic! I'm gonna try it for sure. What is that delicious looking yarn you're using? It's a scrap of sock yarn, but I don't recall where I bought it. It's pretty, isn't it? Wow! I'm not much of a sock knitter but your short rows look great! Much nicer than what I've done before. Great instructions as usual! Hmmm, gonna hafta experiment with this technique! I like it! You're brilliant! So, could you please explain how this would apply if I wanted to substitute this in the place of another heel? 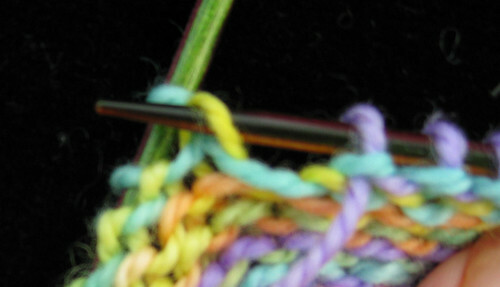 Let's say I am using magic loop and knitting a 60-stitch toe-up sock pattern that has me starting my heel when I am 2 inches short of the back of the heel. Would I start your heel version at the same place? 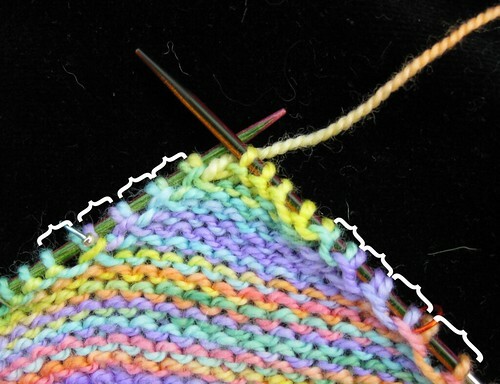 Also, if I have an average sized heel and instep, would I just place markers on either side of the 10 middle stitches where I am working my heel and then just follow your instructions as presented here? I apologize if these are obvious questions. I have only knitted 3 pairs of socks, so I am still quite the novice on turning heels. 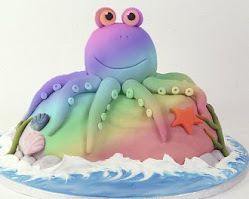 thank you for your kind comments on my blog!!! as always your tutorials are excellent! well thought through, and excellent explained!!! Wow! Thanks for the brilliant tutorial. I found it at the eleventh hour, trying out every short-row toe/heel technique on the internet. :) This one is an immediate favorite. When closing the gaps, I had lovely results doing ssk on the knit rows and p2tog on the purl rows. 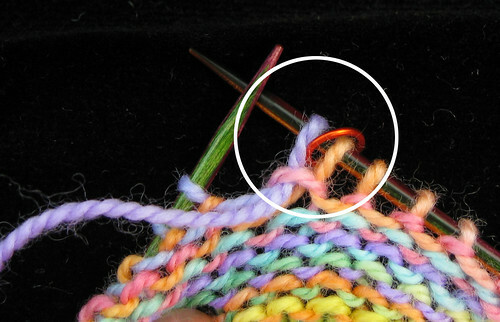 This hides the "made" stitch behind the "real" stitch and creates a pretty line on both sides. Can't wait to try it - I love your 'regular' Fleegle heel. 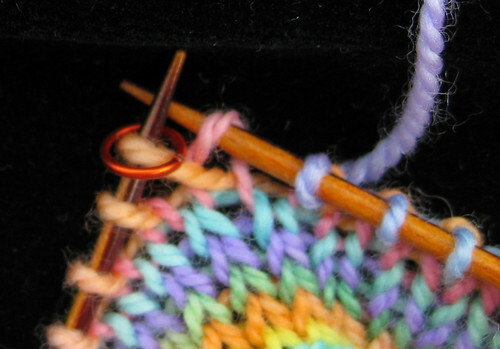 I came to your blog and the short row method via a roundabout way. I wish I'd found it sooner! 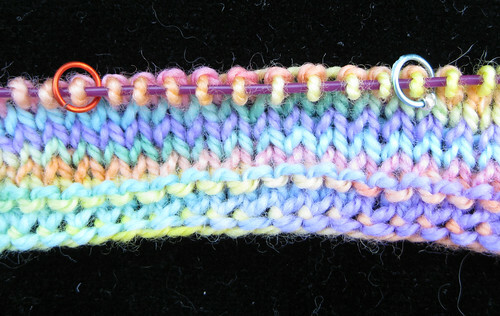 I've always struggled with short rows (and wraps - aaarrgghh), but this method is BRILLIANT! Thank you so much for making my socks look better! Did you hear me cheering from Canada, right on Georgian Bay, I know you must have heard me cheering from across the bay. Now's the time I break into song. I made my first Fleegle Sock and the heel is lovely. It's the first sock that I have made myself as the others are going to a programme in my neighbourhood that can use them. The sock fits perfectly. The heel fits snugly, not slipping or sliding. 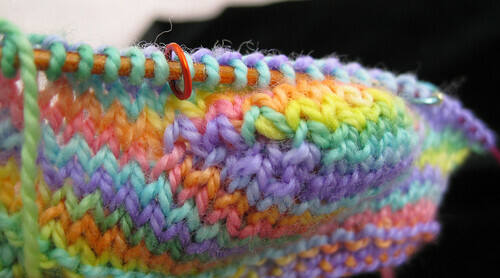 I want to apply the "The Fleegle Symmetrical Short Row--No Wraps, No Holes, No Hassles Heel" to the Fleegle sock. 76. I did have trouble picking up the bump on the back of the plain st. That was using the fine yarn. The other sample I made was a much heavier yarn. They turned out well. If I apply this to the Fleegle sock I can't figure out the math. I thought perhaps I would use 13 centre sts. and fudge a bit with the side stitches but I'm not sure what I'm doing. I have printed out your tutorials, read and re-read them. I know I'm going to go DUH! when you or someone tells me how to do this. Thank you so much for taking me down new paths. I know someone will ask why do you want to do the second heel when the first one fits so nicely. Well, it is just there and I want to see it in a sock. Thank you, thank you, Janet. 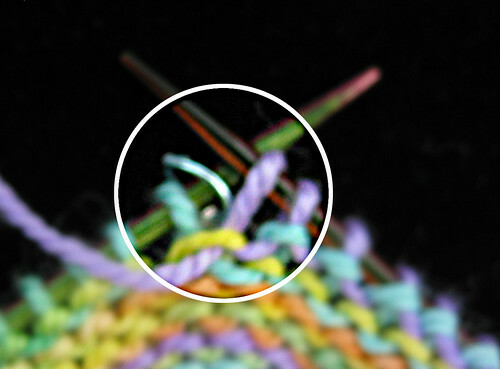 What yarn is that in the photos? And why doesn't the no wrap short row heel seem to work with worsted weight yarn?? Cool, how do I incorporate this into my current sock pattern? I would love to do this. I'm fairly new to sock knitting. How do I substitute this in my current pattern? Thank you so much for this awesome short row-method! I tried several and yours is the only one I can do without looking it up. And it looks so neat! On both sides. 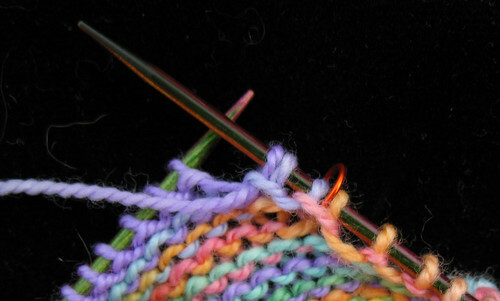 I am using it currently in a sideways knitted leaf-shawlette to form the leaf-border and it is just great! I will mention you in the pattern of course. 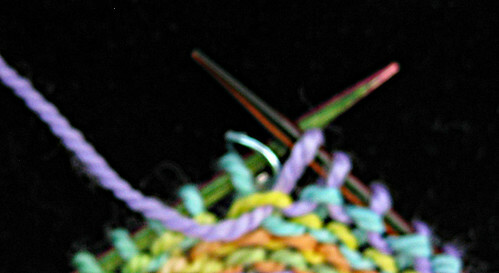 I will publish it in July or August on ravelry! That is so awesome! Thanks a lot for this incredibly amazing short-row method... I prefer the p2tog through back loop :). 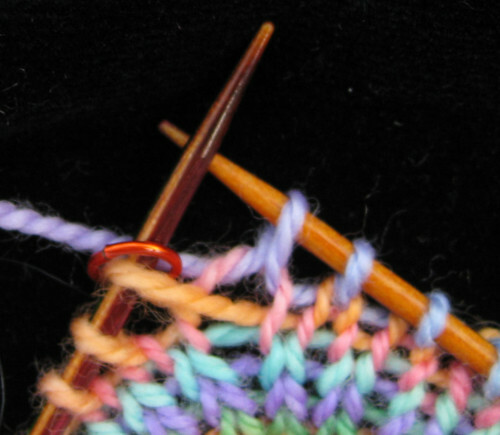 I am currently using it for a sideways knitted leaf-border shawlette and it is so - wow! Looks nice and neat on both sides and that is what I needed. I think this looks great , i cant wait to try this. Thanks so much for sharing.